A conversation that took place a fortnight ago between a shopkeeper and a resident of Nawalapitiya inspired some thought. The shopper, distinctly a labourer from the area, visited the wayside outlet to purchase two sticks of a favoured brand of cigarettes, and was audibly dismayed to learn that he must now pay Rs. 130 for what had cost Rs. 110 just days before. “Mung gey wadey apitama gahana eka, api hembath wenna oney munta salli kanna,” he wailed, which translates to “they (governments) are always fleecing us, and we must toil to make money for their living”. But the conversation, and his misery, did not end there and in fact it took a turn for the worse, when the shopkeeper told him there was talk of banning sales of single cigarette sticks, whereby only packets of 20 can be sold. The worker, potentially a daily wage earner, for whom a one-time spend of Rs. 1,300 is extravagant was shocked to learn of this travesty and let out his candid thoughts on this ‘madness’. Alcohol and tobacco consumption are rife in the plantation sector and amongst blue-collar segments, and whilst acknowledging the grave health impacts of their abuse, they are part and parcel of life in these segments for both men and women, and they consider it integral to rejuvenate at the end of a hard day’s work in the fields. Remarkably, many of them have lived well past 65 to tell the tale. As detailed during his budget presentation on 5 March, the Finance Minister increased Excise Duty on cigarettes by 12%, and he hopes to net in over Rs. 370 billion in additional revenue from the total Excise bracket, in a year where Sri Lanka is still anticipated to fall Rs. 2,200 billion short of its total expenditure. Clearly, the Sri Lankan Government and its treasury need to grow and safeguard every bit of its revenue. The Rs. 10 increase in the price of a cigarette will be felt harder by 80% of the population who earn less than $ 5 a day, in effect 80% of the smoker base. Naturally, there will be an immediate impact on purchasing power and volumes, and the Rs. 117 billion the Government earned from the tobacco industry last year would come under threat. There is the school of thought that following an initial drop, sales will eventually plateau and stabilise revenues along the same lines, but government and policymakers must start thinking of what would be should they push the envelope too far. In effect, it is negating its opportunity to earn more over a longer period of time. Revenue is paramount for Sri Lanka to exit this period of volatility over the medium-term, and we must be prudent and practice tight controls during this period, putting aside petty politics and personal gains. Last year, it is interesting to note that in China, a country with an extremely large and efficient labour force, the national tobacco regulatory body set a target to increase tobacco sales by 6.1 billion sticks. The above statement is in no way intended to detract the dangers of smoking, which is by all means harmful to health, but we must be practical in how we approach our diverse and unique markets and their consumers who evidently make an informed choice to do so. 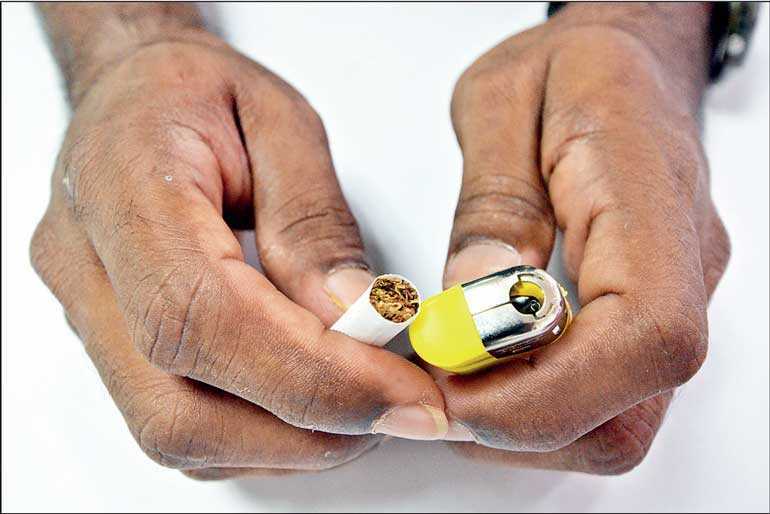 Cigarettes in Sri Lanka are expensive, and rightly so to discourage persons – especially youngsters – from the habit. But we must be careful not to tip the ship, and a potential ban on stick sales will no doubt add to that possibility and government will see its revenue plummet. Sri Lanka is not a developed market, and the vast majority of its consumers live simple lives earning just about and above the minimum wage, which is why many FMCGs from biscuits to washing powder have launched ‘buddy’ products into the market. These are extremely popular amongst lower income segments with limited purchasing power. Such draconian regulations will impact consumers and even small traders and businesses. Stick sale bans have been implemented in other markets similar to Sri Lanka with negative outcomes. In Africa, the African Cooperative for Hawkers and Informal Business criticised the action saying it put vulnerable shopkeepers at risk, adding it was difficult to police in towns with high population density. In Pakistan, the government failed to effectively implement such a ban and sales went on unchecked at most small-scale retail outlets, with only larger established outlets conforming with the law. The sales at outlets had mushroomed once again after over 700,000 small-scale businesses under the All Pakistan Cigarette Pan and Beverage Retailers’ Association had protested the impact on their livelihoods and daily income due to the ban on stick sales. In Sri Lanka, there are reportedly over 72,000 retailers of cigarettes, and over 172,000 livelihoods supported by the industry infusing Rs. 11 billion into these local economies, and the Government must consider the impact of its actions on them. The Government cannot offer any alternative as the smoking culture has a series of habits and complementing consumption patterns and economies entwined with it. Furthermore, how will the state finance the shortfall in revenue; will this translate to further taxes on the public, which would also become the burden of the non-smoking public? Revenue earned from tobacco is one that glitters in the Government’s not so long and illustrious list of earnings, despite the industry not falling into the fold of ‘gold’ or a treasured sector. But we need to protect it; from the standpoint of revenue considering our dire state and also from the perspectives of consumers and the trade. We cannot dictate choice to consumers who are literate and make informed decisions. When a state fails to deliver upon their expectations, naturally the market will conjure up its own solutions.